I'm having some problems with the install of KDE Neon which I probably shouldn't be. Although I followed the day zero fixes thread, and linked other thread, it still likes to go into the black screen death sleep. Sometimes it actually needs a hard reboot to get the display back. Sleep and resume doesn't always do it. Graphics acceleration of any type seems to be broken. SMPlayer with it's configured video type of "gpu" doesn't render properly. It renders some of the top of the video frames then it kind of explodes into the framebuffer filling the whole width of the screen with what I assume to be the video frame with the lines end to end. After that is the rest of the screen, further down and offset. I tried building an SDL program that I use. When running one of it's executables it told me something interesting. That's not great. why is sunxi_dri not working? Should I just cut my losses and re-image, or is it an easy fix? check power settings. the turn screen off after 10 minute option CAN NOT be turned off. you can uncheck and apply but it does not "stick" and if your screen gets turned off after the 10 minutes you pretty much have to hold power long enough to power down and reboot. I am trying to set the 10 minute time to 90 minutes to see if that "sticks". KDE bug? It seems like there was an update in the last couple of days which fixed the GPU driver as far as SMPlayer is concerned at least. The window draw seems to be corrupted but that's no big deal. The contents are rendered properly now. I just ended up turning off the option to turn off the screen and set it just to dim after a while. It was too much of a headache. Just a note here. I didn't reinstall the KDE neon image. I did however try it from MicroSD while the eMMC install still had problems. I guess the Day 0 release had a few other issues too, as the downloaded image is newer. For anyone considering reinstalling. Careful! I haven't found a straightforward set of docs. There's a few things that need to be noted. The eMMC has two smaller partitions which are only visible with fdisk. They don't show with programs based on parted. When a MicroSD is inserted, the name of the eMMC shifts to mmcblk1 from 0. (I can't remember the exact name sorry). When the MicroSD also has a bootable image installed this can be confusing because they will both have the same volume names for the main partition. There are instructions floating around on how to copy to eMMC, but I haven't tried them yet. Seeing the two extra partitions on the eMMC that aren't in the downloadable images put me off. Lastly, don't change the session properties to Plasma (Wayland). It'll lock the Pinebook up. I saw the option and was curious. I tried a few random video files and got ~50% chance to play it properly on pinebook. Looks like the video decoder from day 0 KDE installation is quite picky. It plays smoothly 720p [email protected]/s but then fails (displays some random lines) with 480p [email protected]/s file. (11-15-2018, 11:30 AM)fitter Wrote: [ -> ] I tried a few random video files and got ~50% chance to play it properly on pinebook. Looks like the video decoder from day 0 KDE installation is quite picky. It plays smoothly 720p [email protected]/s but then fails (displays some random lines) with 480p [email protected]/s file. SMPlayer plays everything I threw at it fine, strange. I tried to play 4 video files, two of them glitched, rest was ok. But as I said, I'm still on default KDE, I have no time for update now (I'm using it for work ). Btw. do you know the changelog of the newest KDE Neon release? Does it include ayufan changes? 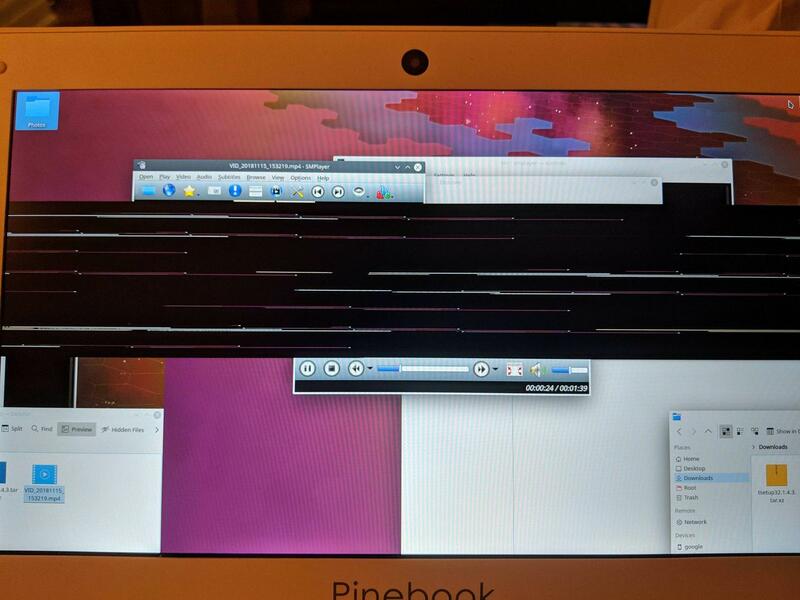 this is what happens if i try to play video in KDE on my pinebook. smplayer just flips out. (11-16-2018, 08:27 AM)caps Wrote: [ -> ] this is what happens if i try to play video in KDE on my pinebook. smplayer just flips out. Make it full-screen, it'll go away and play normally. You can resize after. That's what was happening to me. It stopped doing it after an update. The same videos that did it before no longer did it. Regarding the DRI issue, I haven' found anything clear on it except maybe I have to use the binary on the Wiki or build a version to go with this build.